Julian Arp, born into a family of musicians in 1981, studied at the Academy of Music Hanns Eisler in Berlin and was amongst Boris Pergamenschikow’s last students. He continued his studies with David Geringas and accomplished his solo studies with a chamber music degree in the class of Eberhard Feltz. The recurrent collaboration with musicians such as György Kurtág, Ferenc Rados und Steven Isserlis has also been of great importance. 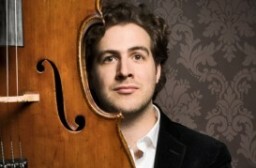 As a soloist and chamber musician Julian Arp enjoys a worldwide concert activity and appears regularly at festivals such as the Schleswig-Holstein Musik Festival, the Rheingau Musik Festival, Beethovenfest Bonn, den Festspielen Mecklenburg Vorpommern, Beauvais, Montreux, SoNoRo Bukarest, Stellenbosch, Stift Festival, the Oxford Chamber Music Festival, „Spannungen“ in Heimbach, as well as IMS Prussia Cove which has had both a strong personal and artistic impact on him. Chamber music could be considered to be Julian Arps greatest musical dedication. Alongside his longstanding duo partner, the pianist Caspar Frantz with whom he has won numerous national and international prestigious awards, he plays with some of the finest musicians of today. The Duo Arp/Frantz has so far recorded three CDs with works of Debussy, Schumann, Chopin, Janacek and Mendelssohn. ( Fono Forum: The Duo Arp/Frantz make the music become a pure celebration. It all sounds and sings.”) The latest recording conjoins the Gamba Sonatas by J.S. Bach and pieces by Hungarian composer György Kurtág. All three albums have gained praise and international acclaim. Julian Arp collaborates in a wide and varied repertoire and engages keenly in performing contemporary music. Composers such as Samir Odeh-Tamimi, Sven-Ingo Koch, Sarah Nemtsov and Violeta Dinescu have written pieces for him. Together with Caspar Frantz and author and publisher Johannes Frank Julian is founder of the International Festival for Contemporary Chamber Music and Literature Zeitkunst. In 2011 Zeitkunst was guest at the Centre Pompidou in Paris, Radialsystem Berlin, Israel and England. In 2013 it took place in Rio de Janeiro. In addition to his concert activity Julian Arp highly commits to teaching and regularly gives master classes in Germany and abroad. In October 2013 he was appointed professor at the University for Arts in Graz, Austria, and has since then been enjoying to teach his own class.